Can I remove myself or someone else from a personal chat room? What is the difference between a group chat room and a personal chat room? Start a personal group and add participants. Add participants to a one-to-one chat. Note: Only users with specific permissions can create Official, Social, and Distribution Groups and their corresponding public and private chat rooms. 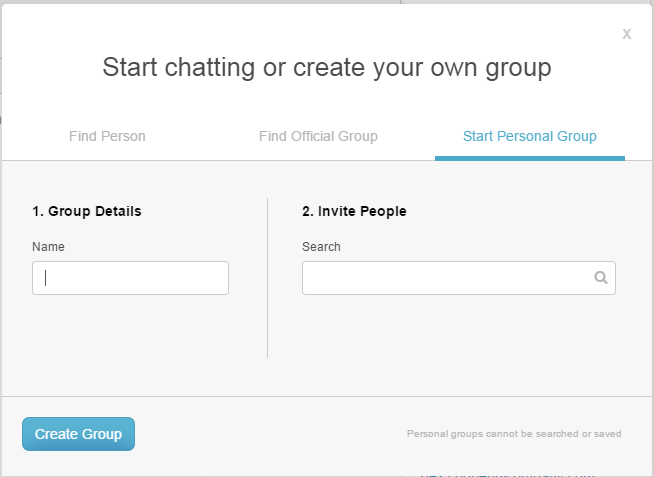 To start a personal group chat room and add participants, in the chat roster, click the +. Click the Start Personal Group tab. Type a name for your group in the Group Details Name box. Search for and select other people to add to the group in the Invite People Search box. To open the new personal group chat room, click Create Group. You or other participants can add other participants to the chat room at any time. Invite new people to a one-to-one direct message chat room to create a new personal group chat room. From a one-to-one direct message chat room, click Invite. In the Invite new participants box, begin typing the name of the person to invite to the chat room. 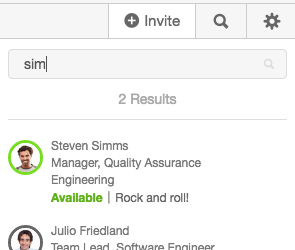 Select the person you want to invite from the search results. PureCloud creates a new personal group chat room. If you want to add more people, continue to use the Invite new participants box to search for and add people. To rename your chat room, hover over the current name in the chat window and click the Edit subject icon. Type a new name. Note: Users in a personal chat room are members of that group as long as the chat room exists.